I don’t know about you but when I go away for a weekend break or overnight stay, it’s always such a palaver choosing and packing the various lotions and potions. It can be hit or miss on the toiletries that hotels provide so I always end up carting all my own stuff with me. So I was really excited when I heard that Montagne Jeunesse had brought out a Travel Pamper Pack to solve our beauty travel needs and snapped up the chance to review the pack. You get six sachets of products in a handy little wallet which is the perfect size to pop into your hand luggage. The pack contains 1 x Passion Peel Off Masque, 1 x Skin Smoother, 2 x Body Washes, 1 x Foot Cooler and 1 x Intensive Spa Hair Masque. It pretty much covers everything you need for an overnight stay, a girlie pamper evening or just head to toe kit for getting ready for a night out. I decided to use everything in one go in a massive pampering session last night! I applied the Passion Peel Off Masque first; it’s really fresh and fruity with pulped pomegranate, passion flower, raspberry, grape, cranberry and vitamin E to protect your skin and deeply cleanse. Once it’s dry you just peel it off! My skin felt toned and smooth. Whilst the masque was doing its thing I used the Skin Smoother to exfoliate my legs, though you can use it on your face or body. This contains apricot kernel, aloe vera and mango. It has a really creamy consistency and a soft, subtle fruity scent. I then used one of the sachets of Body Wash. This is lovely! I love using citrus-scented shower gels and body washes as I find them really invigorating as this was no exception. It has a really orangey scent and, although it seems like a tiny sachet, there is loads! The Intensive Spa Hair Masque is another winner with its zingy lime scent and it only takes 3 minutes to work its magic. It's not as nourishing as the hair treatments I normally tend to use but it left my hair feeling soft and shiny. Finally I used the Foot Cooler. This product is not like anything else I’ve ever used. You massage the creamy lotion into your feet and as you do it dries to a chalky powder. 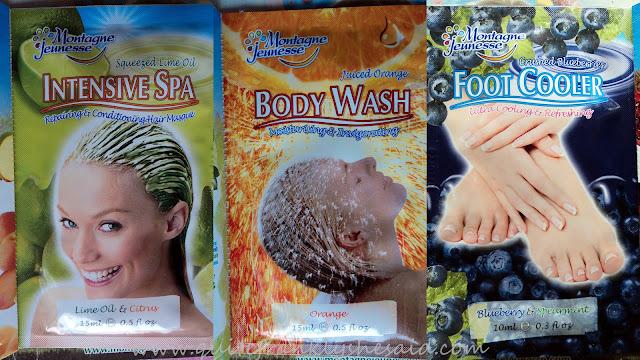 It’s really refreshing, fragranced with blueberry and peppermint, and makes your feet feel soothed and cool. The Montagne Jeunesse Travel Pamper Pack costs £5.00 and can be bought from the Montagne Jeunesse website – postage is only 75p but if you spend over £10.00 you can currently get free delivery. All Montagne Jeunesse products are suitable for vegetarians and made with natural ingredients. Disclosure: I received this product for free to review, however all thoughts and opinion are my own. What a great idea. I love their face packs, I've never tried anything else by them. I am going to pop over to their site and check them out. I am off to Amsterdam in August and this would be perfect to travel with. Wow, I didn't know they had so many products, for body, foot and hair... Interesting!